Authors are ROCKSTARS! : Win one of three awesome books! 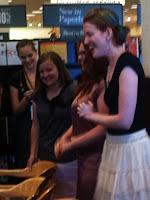 We have three books to give away this time, since we recently interviewed three amazing authors: Kiersten White, Andrea Cremer, and Stephanie Perkins.The Supernaturally/Wolfsbane book release event in Oceanside was SO much fun, we want to bring a little of that fun to you! An uncopyedited galley of Anna and the French Kiss, signed by Stephanie Perkins. PLEASE NOTE: this galley does not contain the last chapter of the book! It should not be used as your reading copy of Anna. Consider it a collector's item. Please only enter to win this galley if you have already read and loved Anna, or if you promise you will read the finished copy of the book. We will give these fabulous books away separately, so there will be three lucky winners! Deadline to enter is August 28th or whenever we hit 100 followers...whatever happens first! EDIT: This contest is now closed. A winner will be announced soon! You are so welcome, Angie! :) We love sending books to our listeners.